One of our friendly Technical Support staff will help you through the troubleshooting process. If the problem persists, our Technician will verify if the product is under warranty, and if so, provide you with a Return Material Authorisation (RMA) or Dead On Arrival (DOA) number. A completed RMA/DOA form together with return instructions will be sent to you by either email of fax. 3) The product to be returned (including all accessories and packaging where possible in good condition). Take the listed item (from Step 2) to your Point of Purchase, or send or bring to D-Link#. You will receive your product replacement within 1-5 working days* depending on stock availability and the store's policy. Check with your Point of Purchase or the D-Link RMA Department for the approximate dispatch date of your product replacement. # Please Note: If you decide to return the product directly to D-Link, you are required to pay for the return shipping. # Please Note: If you decide to return the product directly to D-Link Authorised Service Centre, you are required to pay for the return shipping. 1. To receive your 3rd Year Warranty, eligible product(s) must be registered within 90 days of purchase. D-Link has the right to refuse products with visible physical damage. 1) When will the new warranty terms become effective? For all products purchased post-1 Sep 2013, the new warranty terms will apply. For those products purchased before 1 Sep 2013, the existing warranty terms will remain. The D-Link website's warranty tool will be updated to reflect this. 2) Can customer get new-for-old replacement on all D-Link products purchased before 1 Sep 2013? For consumer products that are less than 2 years old, new-for-old replacement will apply if it is still under warranty. This is also subject to stock availability and store's policy for end customers. D-Link will continue to support our resellers and distribution partners in providing better service to our customers. 3) Is power adapters included as part of the new warranty term? Internal fan and power supplies are part of product's warranty. External power supplies have a 1 year warranty period. 4) I am an end user, where can I service my D-Link products? The end user will generally prefer to return their product back to their place of purchase. However, they also have the option to contact D-Link RMA department directly. D-Link can service the product or replace the product. D-Link does not provide a refund to end users under any circumstances. If the model is discontinued but still under warranty, D-Link will replace it with an equivalent product. Please refer to http://support.dlink.com.au/warranty_policy.asp for further details. 5) I am an reseller, where can I service my D-Link products? The reseller will generally prefer to go back to the distribution partner. However, they also have the option to contact D-Link RMA department directly. D-Link can replace or repair reseller returns. D-Link does not provide a refund to resellers under any circumstances. If the model is discontinued but still under warranty, D-Link will replace it with an equivalent product. Please refer to http://support.dlink.com.au/warranty_policy.asp for further details. 6) What happens to all the existing packaging with existing warranty terms printed on them? All existing packaging will be updated as new stocks arrive into the country via a 'running change'. 7) Where can I find more information online? 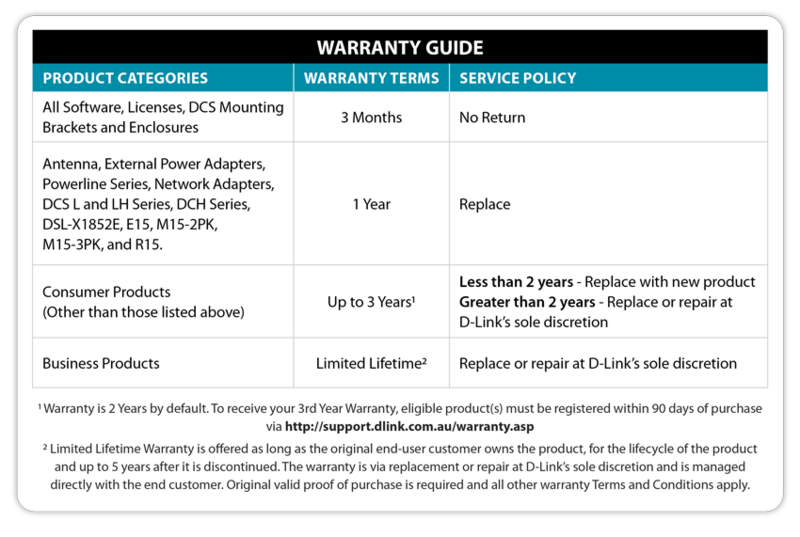 The updated warranty section on D-Link's website can be found at http://support.dlink.com.au/warranty.asp . It has been updated as of 1st Sep 2013.